'Minnie's Mansion' is only 7 miles from Disney and Fully Fenced Pet friendly! Orlando - Kissimmee - Disney World - Florida. 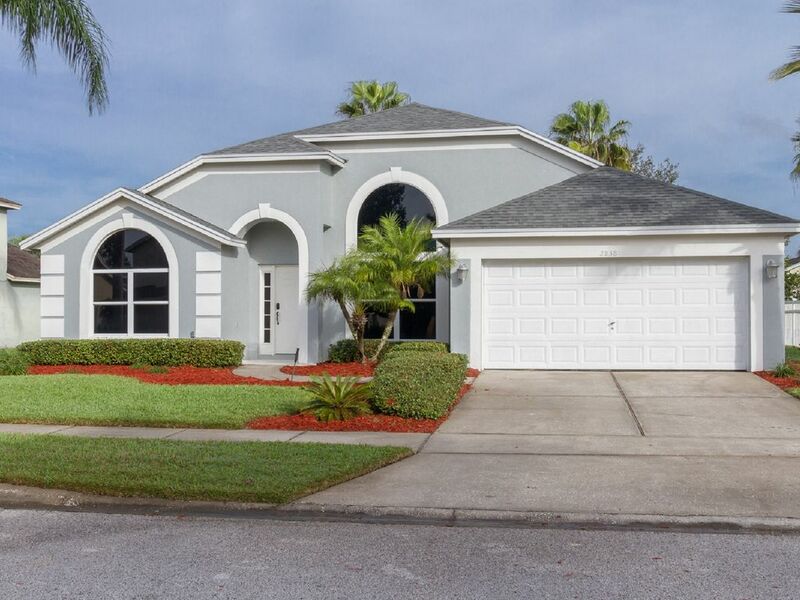 This beautiful, privately-owned home is located very near Disney's Animal Kingdom Park! To our previous guest and future guest. We want everyone to know that we are making significant updates and improvements to the home as of May, 2017 and be ready for our guest by months end. We are changing the homes decor and updating with a new kitchen featuring stainless steel appliances and new "quiet" dishwasher and side by side refrigerator. We are also installing new kitchen hardware, plumbing fixtures, sinks, cabinet hardware and granite counter tops and lighting in the home. We are repainting the interior of the home and have added in the past year new HD Televisions and new furniture. We have changed and upgraded our maintenance system and we are supplying more of the basic items to enjoy your stay. We have seen the issues of recent customers, we apologize that we couldn't get this done sooner, however, we were booked so far in advance - but now we are have scheduled the repairs and updates and are very excited for our guest to continue to enjoy the home you have come to love and enjoy with many generations of guest from the past. We will be posting new photos as soon as the changes are completed! The luxurious master suite is as romantic as it gets. The king size bed has the thickest, plushest pillow top mattress you can find. Relax in this comfortable bed and watch the wall-recessed TV. Want to really relax? Then let the 12 soothing jets of the two person double sized Jacuzzi reinvigorate you and that special person in your life. The huge 6' by 6' two person, twin headed shower lets water strike your entire body. Get ready for that special evening with his and her vanities. Our pool is 36 feet long, 50% larger than a standard pool. The covered lanai has a reclining lounge chair as well as rocker. You will enjoy eating 'al Fresco' while enjoying the cool breeze generated from the fan above the generous dining table. The pool can be heated and it is totally protected from outside pests with its huge screen enclosure. The home has 16-foot vaulted ceilings with huge archways. Its decorator-painted scheme and wallpaper provide a very modern/contemporary flair. The separate living room has a built in desk with internet hookup available as well. Your family room looks onto the pool area and allows you to watch the 55 inch flat screen HD TV at the same time you watch and hear the falling water. Your home has a formal dining room, large kitchen with breakfast area, laundry room, a second bedroom (queen size bed) with the same plush mattresses as in the king master suite, and a bedroom with two twin beds themed in the tradition of Disney. This home is a vacation destination unto itself. It is fully-equipped with everything you would need to make this your perfect vacation. Isn't it time you felt the magic and had a 5 Star Vacation? It's time to be a kid again and watch the nightly fireworks over Cinderella's Castle! Our family offers 4 great properties, if you might want to consider listing #7170 - our 4 bedroom/3 bath executive lake view home; listing #7171 our 6 bedroom/3.5 bath resort home which was recently totally updated as well and our listing #9392 our 4 large 4 bedroom home located in Sun Lake Resort gated community. All of our homes are very close to Disney! I have become a Florida resident and Real Estate broker to assist others with the opportunity to own a place in the Florida Sun. Our family and extended family now offer our guest many unique homes and condos, all very near Disney and we treat them like what they are - our family homes. We live near the homes and take care of the homes. One of our family is nearby to answer your questions and help you with a problem should something occur that you need our help. We keep 're-investing into our properties to assure your family of a great experience! All homes are not alike. Pictures are worth a thousand words - however, if the pictures are of when a home was built new - then they are worthless! Our homes are very modern and super located. Let's face it - the better locations were not built yesterday - but our homes look like they were built yesterday. This is the commitment we make to our guests and our family's future depends on our guest. If you want a cheap home - we are not it - however, if you want a great value - you've found it. Well maintained an geared for families as well as couples. Has huge romantic master suite and oversized fun size pool for kids. Just check out this home - you will not be disappointed! Again - we have completely updated the home as May, 2017! Located very close to Disney resorts, restaurants, shopping and the Celebration Hospital. Why recover in a hotel room when you can enjoy your family in a wonderfully located pool home only 10 minutes from Celebration Medical Centers and also only 10 minutes from Disney World! toilet, shower, jetted tub, Has two person shower, two person jacuzzi and twin vanities. The luxurious master suite bath has his and her vanities, large area to walk around and a huge double jetted two person jacuzzi and also has a 6 foot by 6 foot shower with two separate shower heads. It opens to the large master suite which also has a sitting area and flat screen TV. Our home is equipped with central heating and cooling. Two full sets of linens provided for each bed as well as two full sets of towels for each guest to use. Our laundry room includes a washer and dryer, ironing board with iron and enough laundry detergent to do several loads of laundry during your stay. The home is equipped with electric dryer. Our driveway has off street parking for two vehicles. Parking on the street is allowed - but please remember to park in the right direction and no parking on grass anywhere! High speed wireless internet is available for our guest. We provide two full sets of towels for each guest - that is 12 sets total! Features a large flat screen high definition TV and has a six person full leather sectional that features a lounger as well. New stainless steel super quiet dishwasher. You will hardly know the dishwasher is working! Top Refrigerator with ice maker. Stainless Steel Electric stove with self cleaning full oven. Combination Microwave with vent above the stainless steel range. Our home is self catered. However, we do include an initial supply of toilet tissue, small bath soaps and garbage bags,. We supply enough laundry and dishwasher detergents to do one load per day. Full set of dishes, glassware, pots and pans. Home has both a formal dining room that seats 6 as well as a breakfast nook with seating for 4 guest. Our outdoor table comfortably seats 4 guest under the covered lanai. Comcast Cable TV is available in the home. Game room/office combo that features a foosball table. Located in a comfortable home, not in a garage conversion! Pool area has a lanai that is covered and other deck area inside the enclosed screening area. Many golf courses are within 10 miles of this home. Prominent golf courses are Orange lake (2), Celebration, Mystic Dunes, Reunion, (3) Disney (3), Championsgate (2)and Highlands Reserve. One level home with wide entry areas. a 2 inch riser into the one level home. Very Large Pool, 36 feet long, standard is 24 feet and most pools are 28 feet or less. Has a very large shallow end, great for families that like to play in the pool or have smaller children. Pet friendly, Pet fee is $120 per each pet. 30 Pounds is limit. House was nice, but there was a lot of dog hair. It was on the beds and on the furniture. Other than that everything was just as advertised. House was in a neighborhood that was a little older than those in the surrounding area but it was nice, safe and quiet. Very convenient to all Disney attractions allowing us to come and go throughout the day. Also right off of US 192 which has hundreds of places to eat. Inside was clean and nicely decorated - nice floor plan too. Overall, being a pet friendly place with a good location at a reasonable value was all we could ask for. Unfortunately, we were surprised to see the for sale sign go up in the front yard during our stay. 1. No kettle! Had to buy one which we left in the house for you. 3. No cleaning brush or cloths in kitchen. into the house to avoid this problem. Overall a good experience and a wonderful private home. The house was very nice and clean. It is so convenient to Disney. The house worked perfect for us. It is close to so many attractions and a very nice house. Stayed here with my family for one night as we were in town attending HHN. It was a great place for us and our pets for one night. House was clean, great space, and perfect for 5 of us and 3 dogs. Would definitely stay again. Nearby activities: Disney World, 3 miles; Universal, 14 miles; Sea World, 6.5 miles; Orange County Convention Center, 15.8 miles; Orlando Airport, 26 miles; Golf Courses, within 5 to 10 minutes; Downtown Disney, 10 minutes; Downtown Celebration, 10 minutes; Orlando Premium Outlet Mall, 10 minutes; Two cinema complexes, within 10 minutes; Kennedy Space Center, 55 minutes. Recreational activities in the area include biking, mopeds, helicopter flights, air-boat rides, volleyball, and playgrounds. Departure Clean fee - $120. Pool Heat $30/day. Taxes 13.5% of Gross Rental. Pet Fee ($180) PER EACH PET!. Low Season in parts of January, February, April, May, June, August, September, October, November & December. Peak Season in parts of February, March, April, June, July & August. Holiday Rates applicable for MLK, President's, Memorial, July 4th, Labor, Veteran's, Columbus, Thanksgiving, Christmas and New Year's day.